Christy kindly took video of my rides at last week’s show. 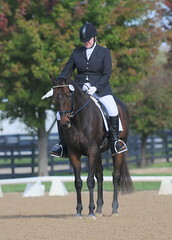 Here’s our winning ride (60.6%) at Intro A. We were really unsteady going down the centerline – a huge horsefly was buzzing Derby’s head, and at one point you can see his head pop straight up. Argh. But once we get off the centerline, things improve. Toward the end of the test we develop a bit more energy across the diagonal and into the second trot circle. What I like most about this test was the fact that I was able to make quick corrections, getting him back on the bit pretty quickly. We do need to get a lot more energy and connection going, which is the subject of this week’s lessons! Overall the test was pretty steady but lackluster. While Derby is no Totilas, I’m not showing off his best gaits. On a non-fancy OTTB, I will have to learn to show his gaits to the very best advantage if I hope to get some really good scores.